Kurdish singer Naaz first garnered acclaim in 2016 with her debut single “Sadboy,” which is crammed with exciting, intriguing production and driven by Naaz’s expressive vocals. Her followup release “Words” is a wistfully intoxicating delight which effortlessly enthralls. 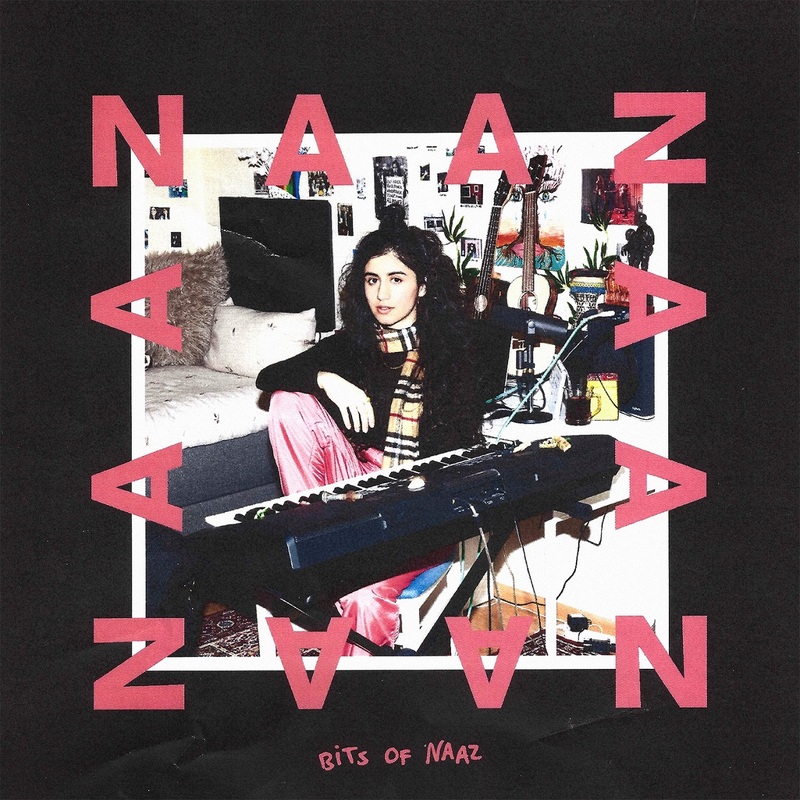 Naaz’s debut EP, Bits of Naaz (released on 04/20/2018 via Dapper/Universal) combines four previously-released singles with four new cuts to create an immensely passionate depiction of adolescence. Throughout the record, Naaz manages to encapsulate personal, yet relatable emotions in a truly awe-inspiring and incomparable fashion, with each song having its own particular identity and mood. Although every one of the EP’s eight tracks clocks in at under three minutes, Naaz manages to make each song encompass an astonishingly beautiful depth of emotion. “Someday” serves as the defiant opening track and is the first showcase of both Naaz’s exquisite vocal ability and her knack for crafting lyricism which is not only catchy but captivating. This optimistic track is assured and cheerful, serving as a fantastic counter to any anxiety or negativity about the future. The EP’s second track “As Fun” delivers engaging, thoughtful lyricism forming a song that feels simultaneously both overwhelmingly jubilant and soul-crushingly sad. It acknowledges the turbulence and commotion which is intrinsically linked to falling in love in a refreshing, authentic way, resulting in an ingenious and engrossing track. It feels impressively innovative in its’ depiction of an uncontrollable yet irresistible roller-coaster of emotion. Opening with a commanding beat, “Pretty” is a defiant anthem which spellbinds with intelligent lyricism conveying an important message. The subsequent track “Mess Me Up” is a fascinating treasure which chronicles a plethora of intertwined complex, multi-layered emotions. It conveys a sense of hopeless confusion while exploring desire for someone despite the potentially troubling consequences. “Words” is the sort of song that can tangle itself around your headspace. Its’ beautiful lyrical sentiment is more than matched than Naaz’s astounding vocal delivery. It’s the sort of track that demands you to re-listen, it’s simply heavenly intoxicating. Every single time you listen to the track your experience of it becomes deeper and increasingly intense, in the best way possible. “Loving Love” is delicately yet exquisitely textured and crammed with almost overwhelmingly powerful emotion. The lyrics are wonderfully vivid detailing an indescribable feeling of carefree euphoria. The next track “Can’t” explores a forbidden love in a way that’s romantically sentimental and unhurriedly mellow. You can feel the anguish in her voice increasing as the track develops, which is perfectly complemented by changes in the instrumentation. And the whole world is ours..
Much like the EP’s opener, closer “Up To Something” is a powerful anthem that makes you feel like anything is possible. It’s the perfect antidote to pessimism. The track directly addresses Naaz’s family doubts about her ambitions of working in the music industry but like all great pop songs, it’s effortlessly universal and madly catchy. While listening to Naaz’s EP is an immense pleasure, seeing Naaz perform is an unadulterated delight. Her unparalleled energy and evident passion is intensely infectious. Throughout her set, Naaz intertwines the songs on this sensational EP with unreleased material, which is just as extraordinary. Listening to her perform live is an unmissable goosebump-inducing pleasure which takes you on a stunning ride like no other. Just like her EP, every bit of Naaz on its own is a divine piece of art, but when combined to form a narrative, the result is out of this world.